Following the Jazz Concert, students congratulate seniors Ben Pavlik and Eddie Ryan on their work in the Honors Jazz Ensemble. 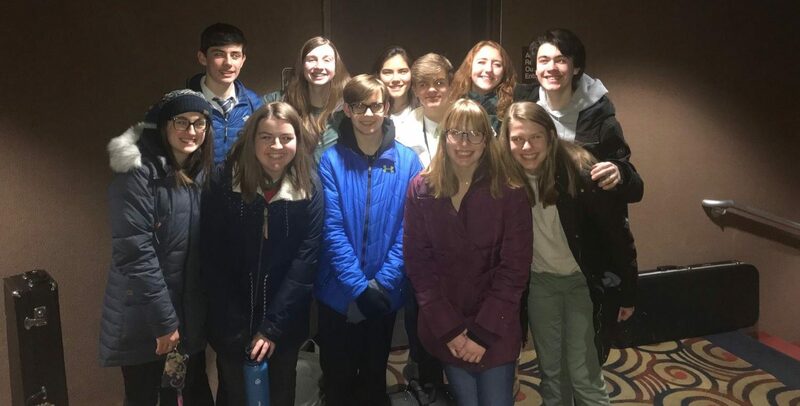 At the end of January, musicians from York went down to Peoria for the annual Illinois Music Educators Conference (IMEC) to perform with various ensemble groups. Students were selected based on auditions in early November of 2018 for the Illinois Music Educators Association (ILMEA). Auditions consisted of performing excerpts of selected pieces, scales and triads and a few measures of sight reading. 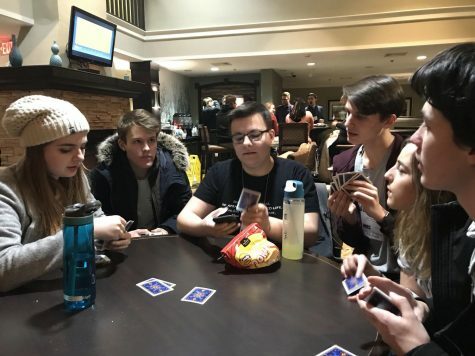 This all led to a weekend in Peoria for the students with the top auditions. 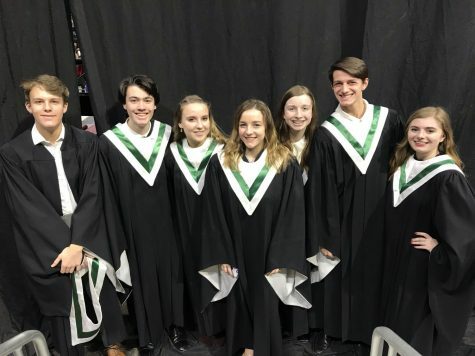 The seven choir students selected for the All State Choir prior to their culminating performance. Kungl was a member of the All-State Chorus with six other York students. Overall, York sent 23 students to All-State for Band, Orchestra, Composition and Chorus. York’s Performing Arts program sent one of the most in the state, a very big accomplishment for Performing Arts chair, Bill Riddle. Though there were a lot of students sent for choir, there were also many students in the All-State and Honors Orchestra and Band. Siena Olson, senior, was selected for the Honors Orchestra based on a chair placement audition and saw the true educational value of the experience, especially since she is applying to many schools for Music Education. “ILMEA Honors Orchestra inspired me to conduct classical music in the future and teach students to love the complexity and beauty of classical music as much as I do,” Olson said. All of the students had an opportunity to perform throughout the weekend with a Composition Concert on Thursday, a Jazz Concert on Friday, and the final group performances on Saturday. For many students and teachers, the Jazz Concert was the highlight of their weekend. Senior Eddie Ryan was in the Honors Jazz Ensemble for trombone and found it to be a highlight of his York experience. Congratulations to all students at IMEC this year! 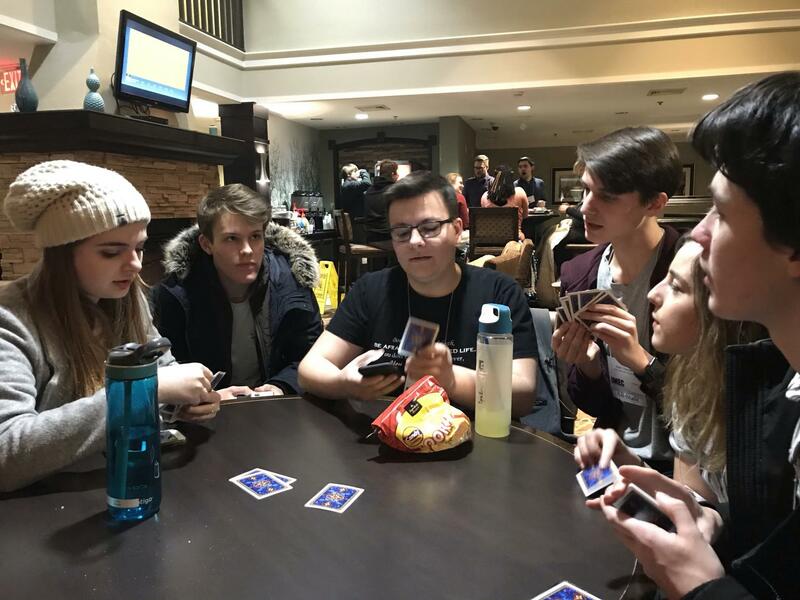 ILMEA musicians play cards in a break prior to a four-hour rehearsal.